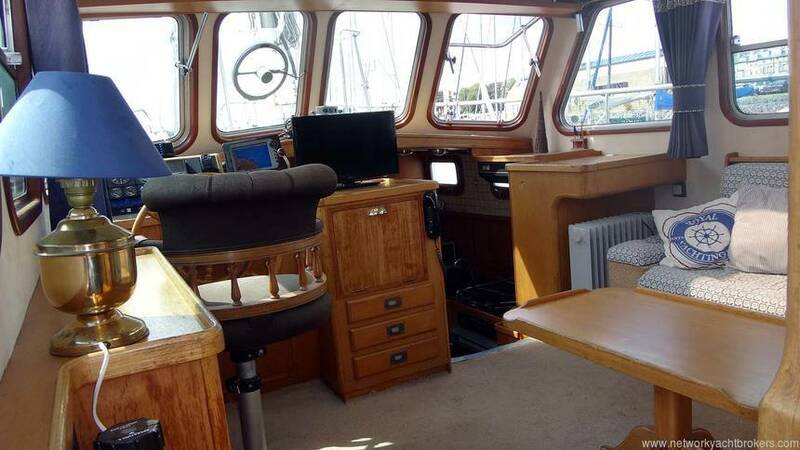 Unique opportunity to purchase blue water, ocean capable passage maker. 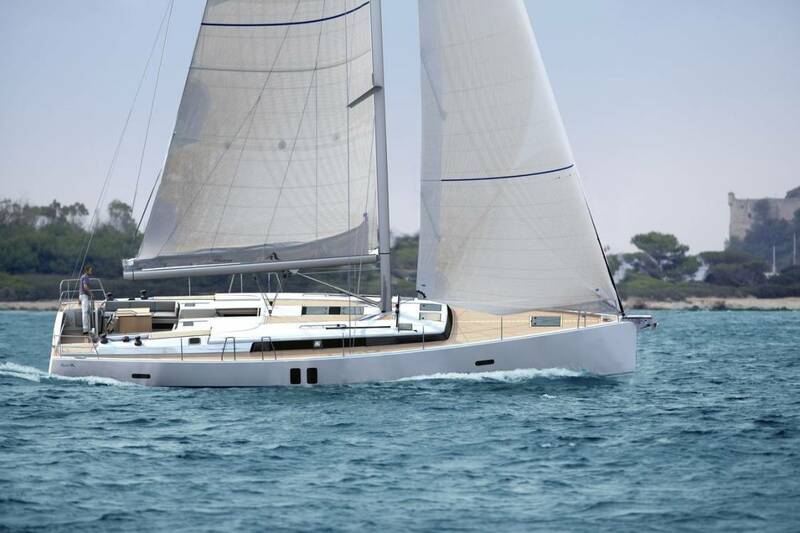 To commission this yacht today with the level of fit out and level of equipment would cost more than a million pounds. 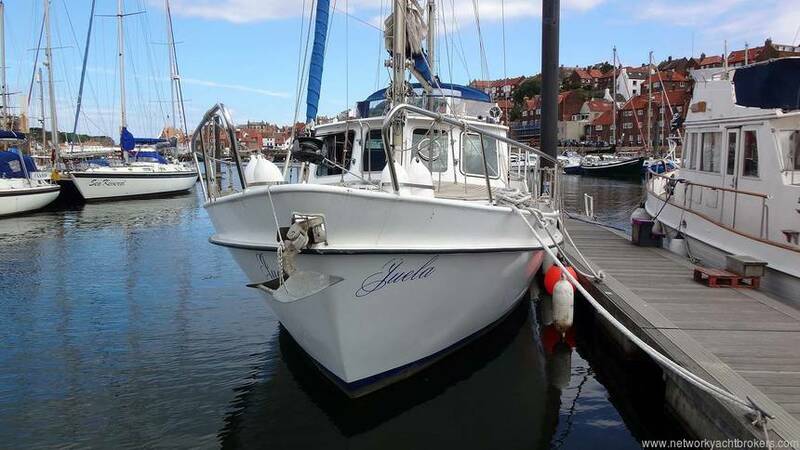 This ready to go motorsailer is available at a fraction of that cost and is ready to share adventures with her new owners. 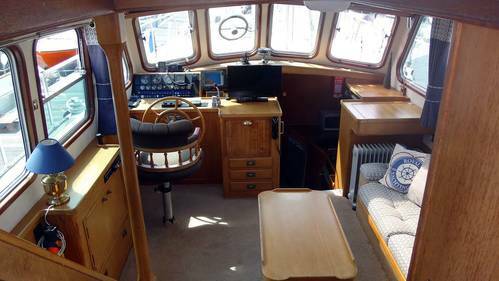 Built and equipped for spending extended self-sufficient periods afloat, this is the ideal platform from which to explore. 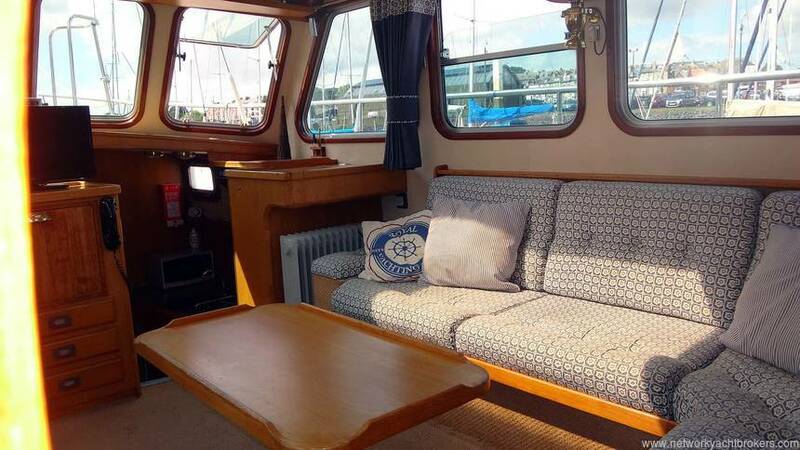 The level of accommodation would also be ideal as a liveaboard as she features two large sleeping cabins, two heads, fully equipped galley and comfortable wheelhouse saloon. Ketch rigged with aluminium deck stepped spars, stainless steel standing rigging and a decent suit of sails including cruising chute. 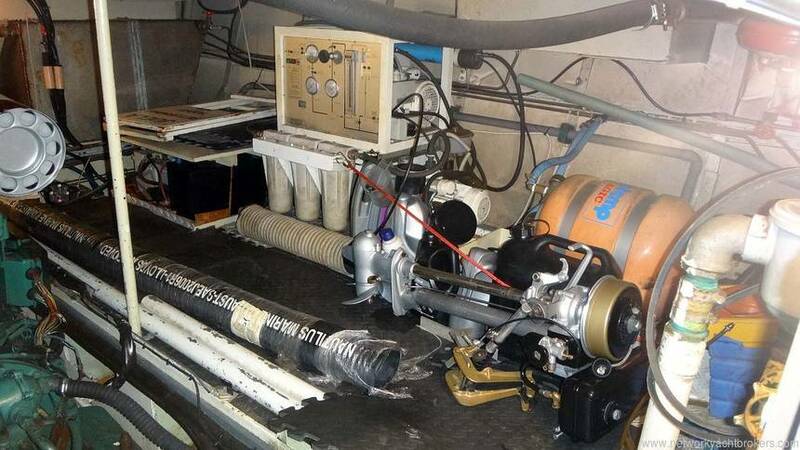 Reliable, well-maintained inboard Volvo Penta MD70C with a shaft driven bronze screw. 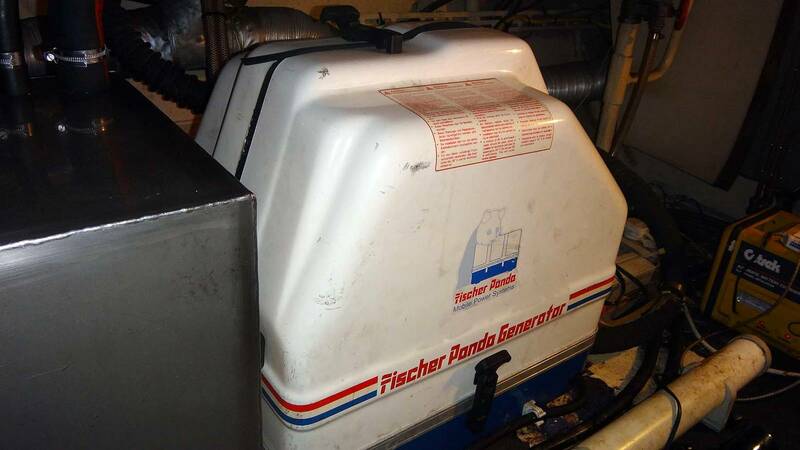 24V battery bank and Fischer Panda generator make onboard living that bit easier. 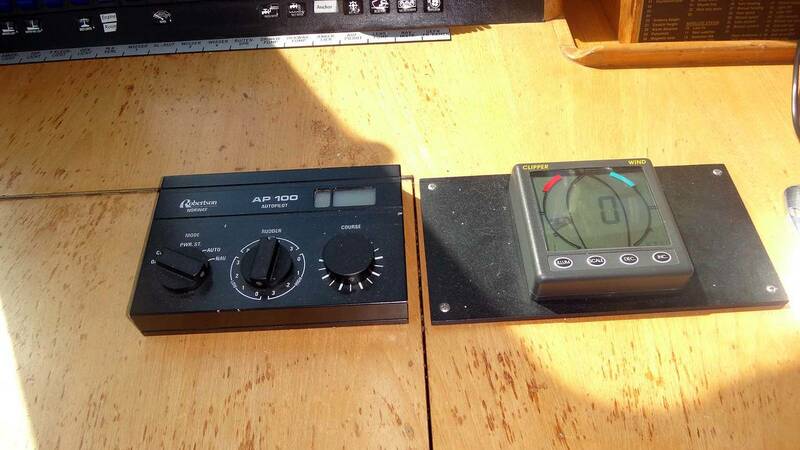 Electronics include colour plotter, radar, autopilot and DSC VHF. The vessel is now ashore for antifoul and Insurance survey. 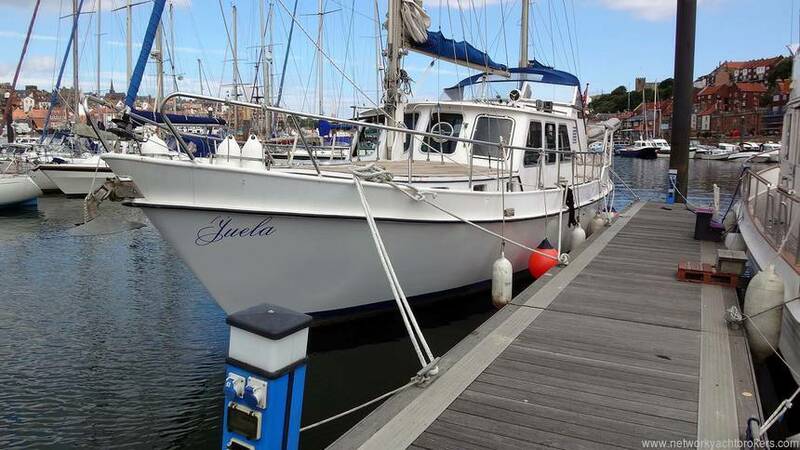 This is an ideal opportunity for any prospective buyer to see her ashore and have a prepurchase survey in their name. If you would like some out of water photos, email me. 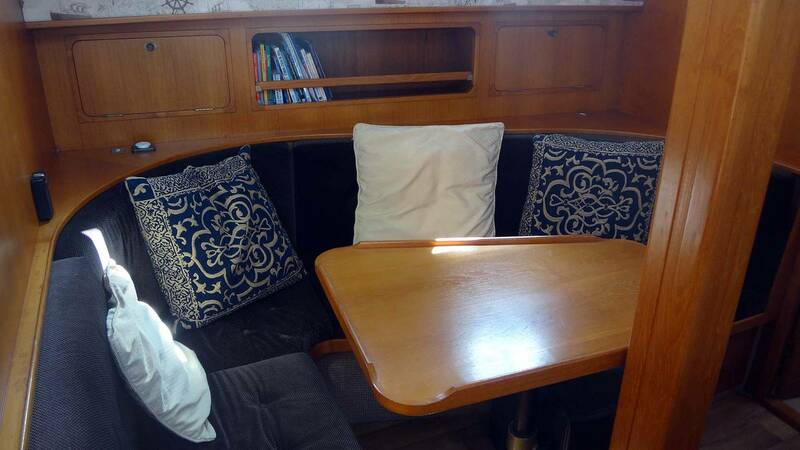 Below decks is warm, welcoming and very spacious. 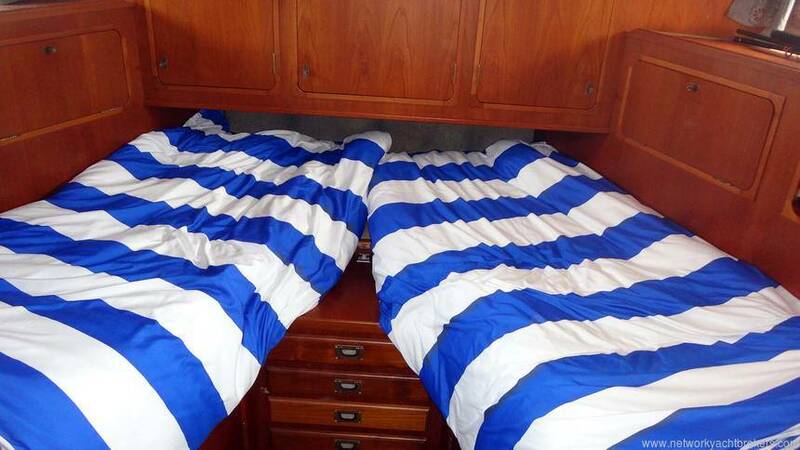 This is a functional boat with an emphasis on comfort. 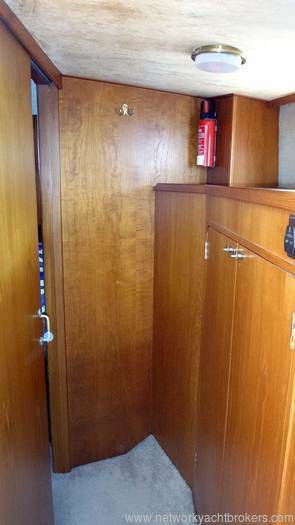 The interior woodwork is a combination of solid and veneered teak with no sharp edges in sight. ,Yes, there is a bit of wear and tear here and there but no more than you would expect on a boat of her years and experience. The main saloon is accessed via the aft deck. 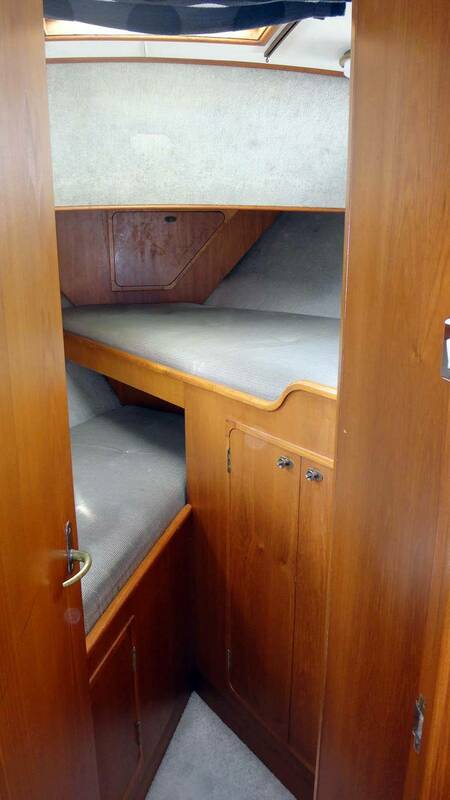 This is a light, bright area thanks to the large panoramic windows either side and the four large windscreen panels. 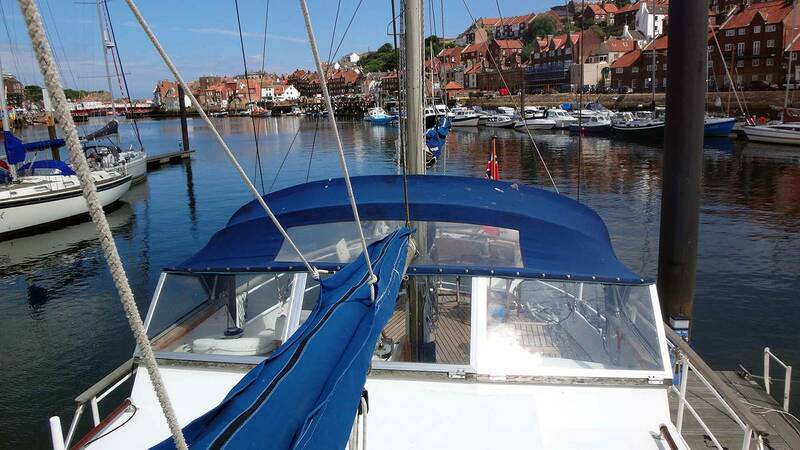 There is also a perspex sunroof panel designed so you can watch the sails from the lower helm that lets in even more natural light. L-shaped seating area to starboard with a low table. 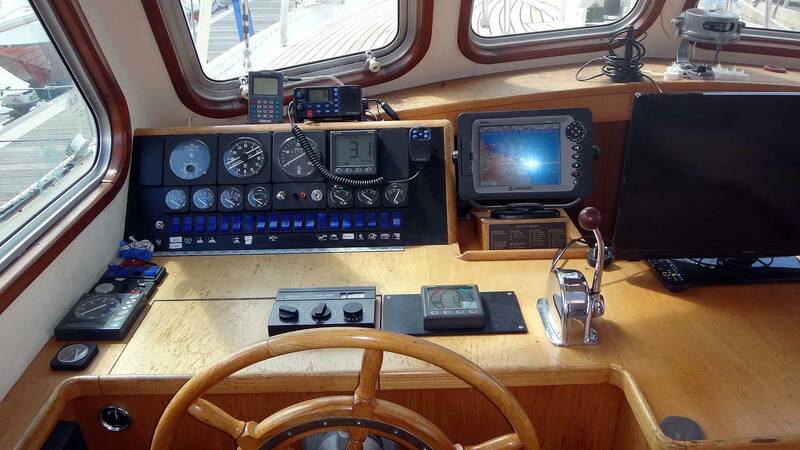 Chart table at forward end of settee and opposite is the lower helm with steering wheel, swiveling pilot seat, and dash with switch panel and navigation aids. 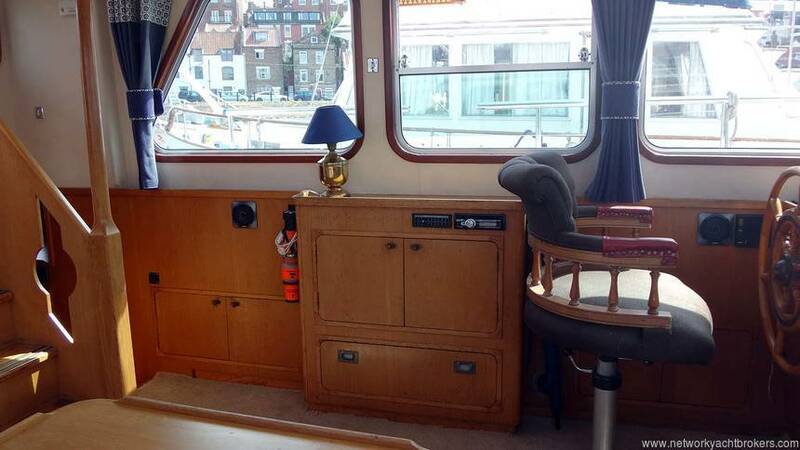 The port side of the wheelhouse is given over to free movement between the helm and the upper deck with inbuilt storage to compensate. 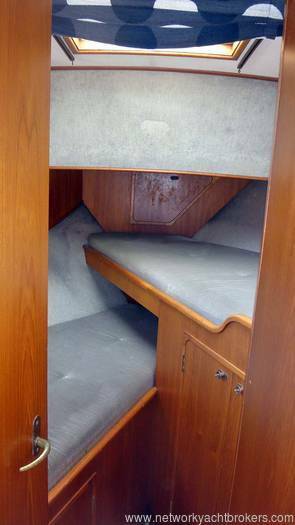 Moving aft and down a set of stairs is the spacious aft cabin. 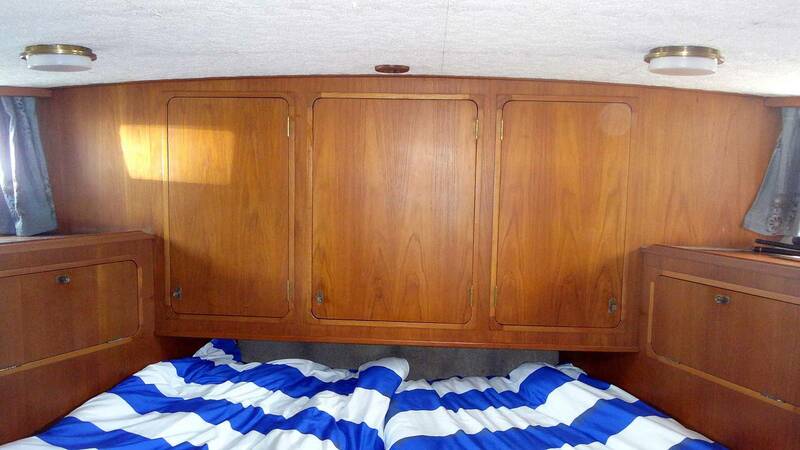 This features fitted cupboards, fitted wardrobes, and twin berths. This has an ensuite bathroom with shower area and sea toilet. This is a very comfortable area and has opening ports and 24V lighting throughout. 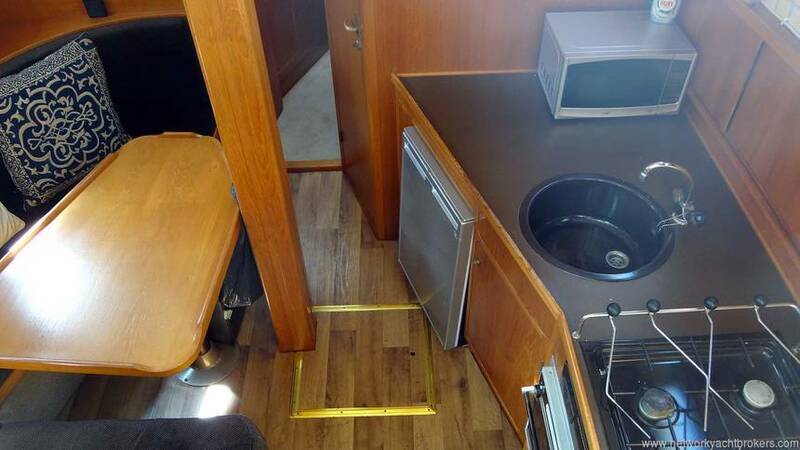 Returning to the saloon and moving forward down a set of stairs is the galley dining area. 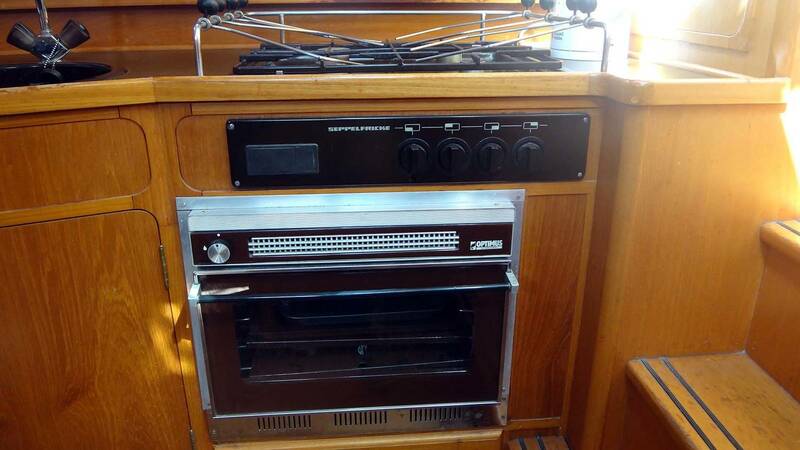 To starboard is the galley with gas-fuelled oven with 4-burner hob and grill. 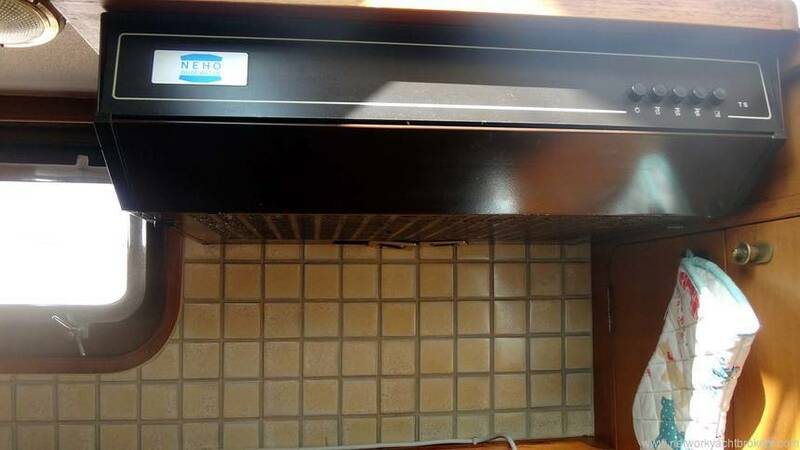 There is a cooker hood to remove any unwanted food smells and opening ports for additional ventilation. 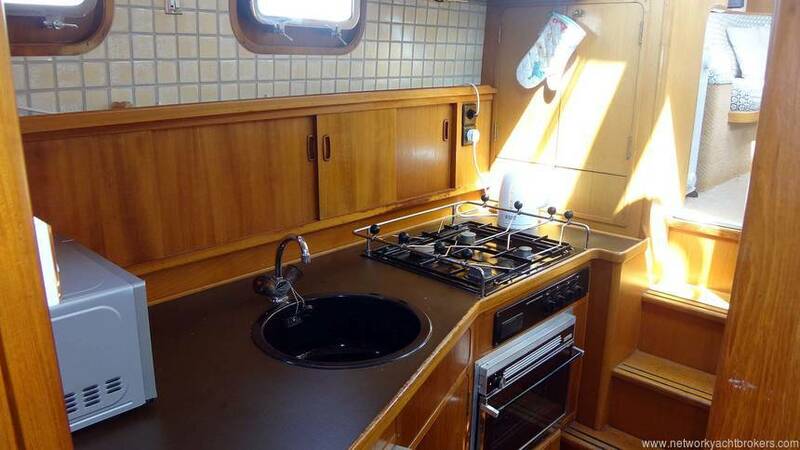 Ample work surfaces, lots of storage this is a boat designed for long range cruising and entertaining. 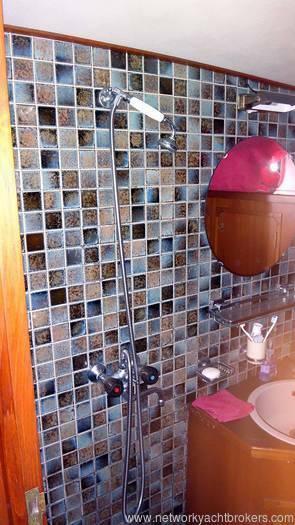 Hot and cold pressurised water to sink. Large capacity Waeco front loading fridge which was replaced in 2016 keeps the perishables and the wine fresh and cold. 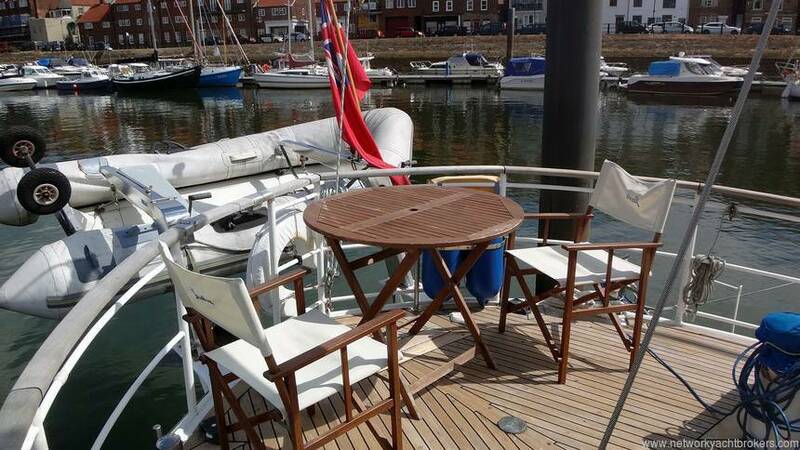 Opposite the galley is a U-shaped seating/dining area. 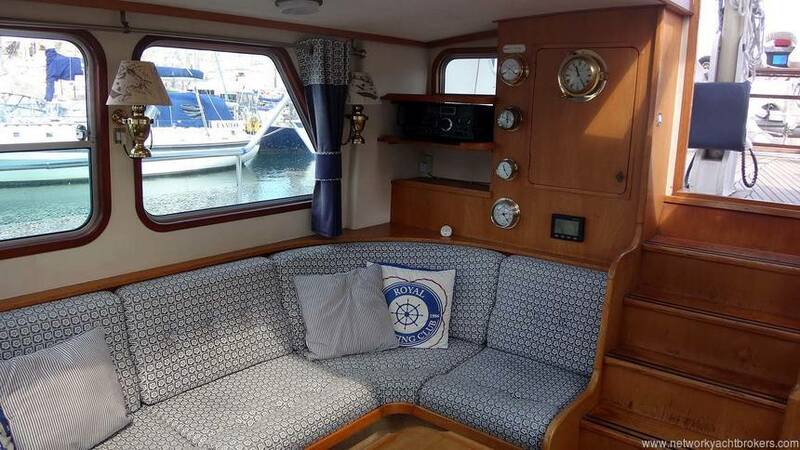 This comfortable, well-upholstered area can sit 6 with ease and is a lovely place to chill. It also converts to a large double if required. 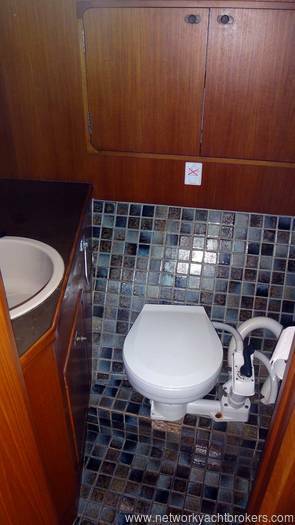 Next to the galley and before the forward cabin is a large day head with sea toilet and sink. The waste from both the heads, sink and galley, go into a holding tank which fits with scandanavian cruising requirements. 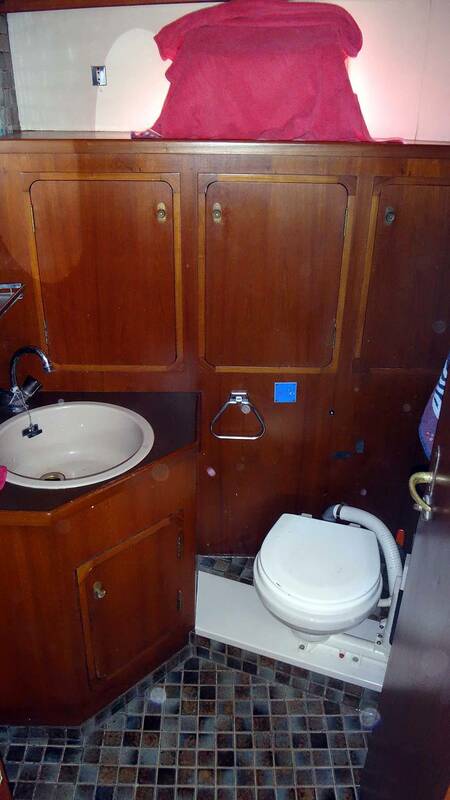 The aft heads and shower are pumped over board directly into the sea. In the bow is a cabin with 2 single berths, storage, and lighting. 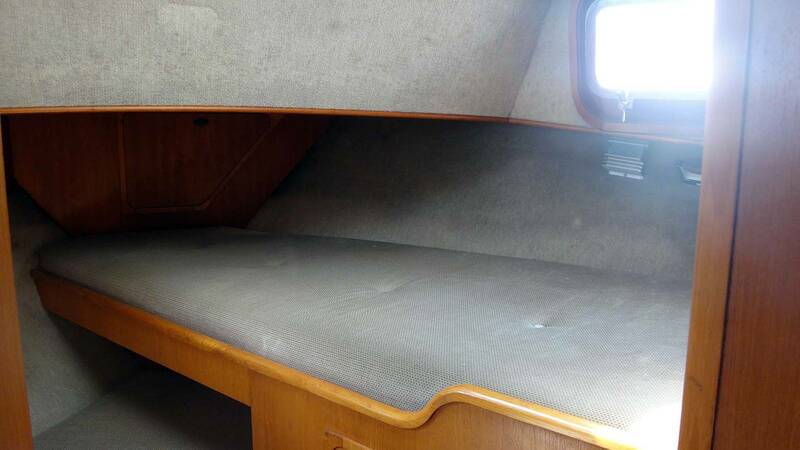 All upholstery is in great condition. 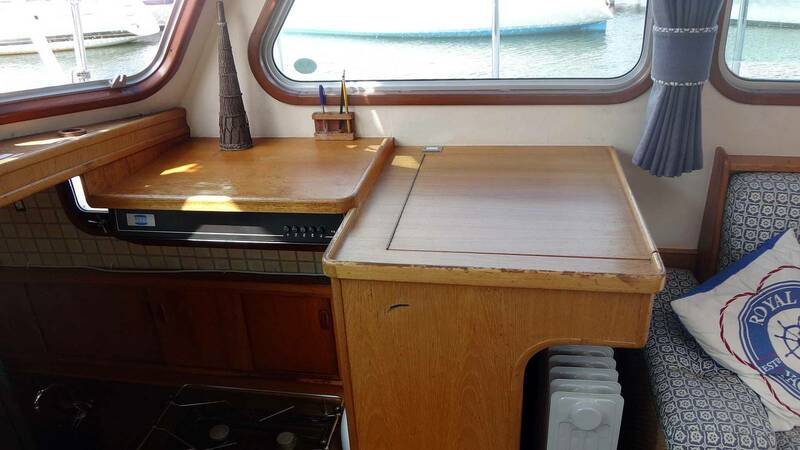 Boat is fully carpeted apart from the galley/dining area for obvious reasons. 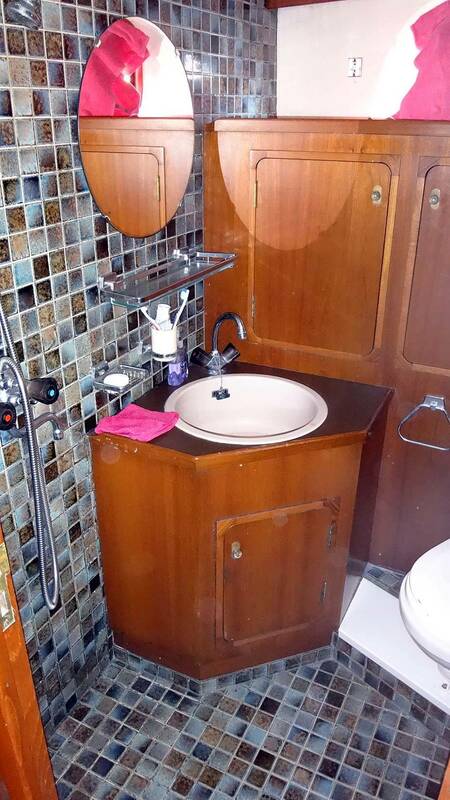 This is instead of wood flooring. 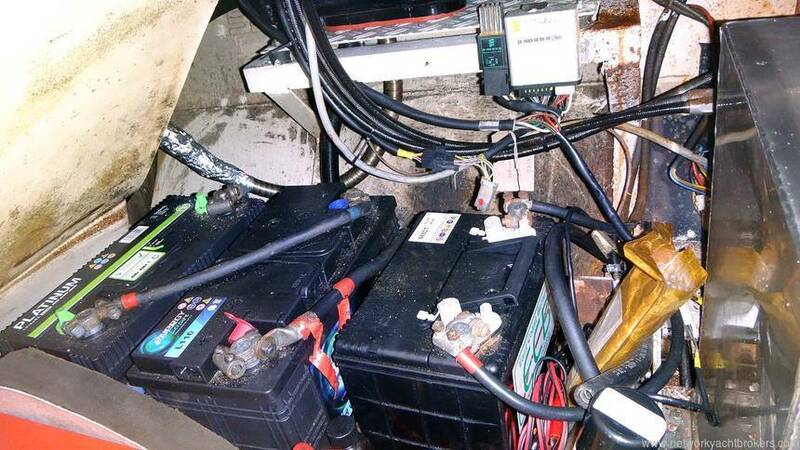 Boat kept warm and dry from diesel fuelled hot air heating system. Steel construction hull using 5mm hull plate. 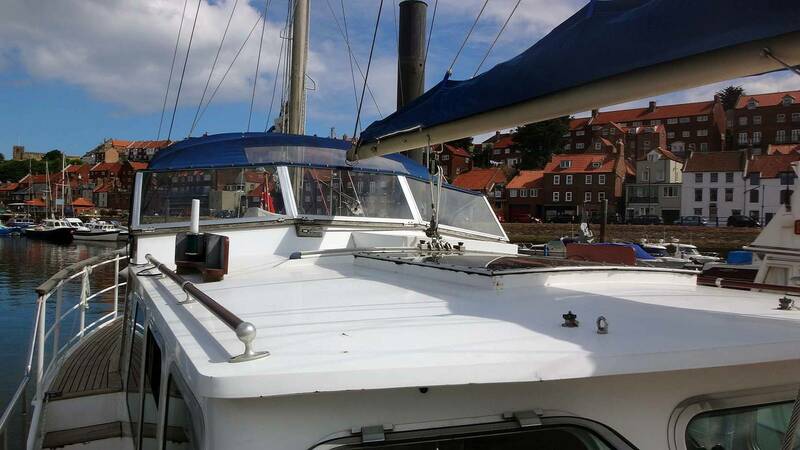 Hull topsides and superstructure painted in white top coat. 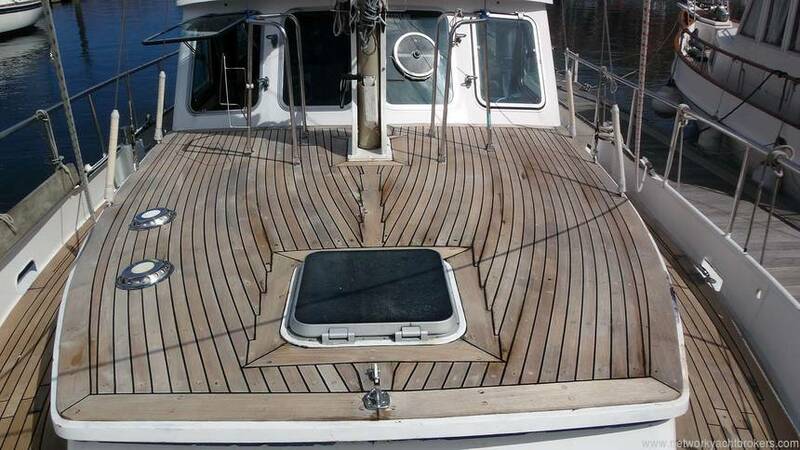 Accommodation, side and aft decks finished in teak stripping in good condition. 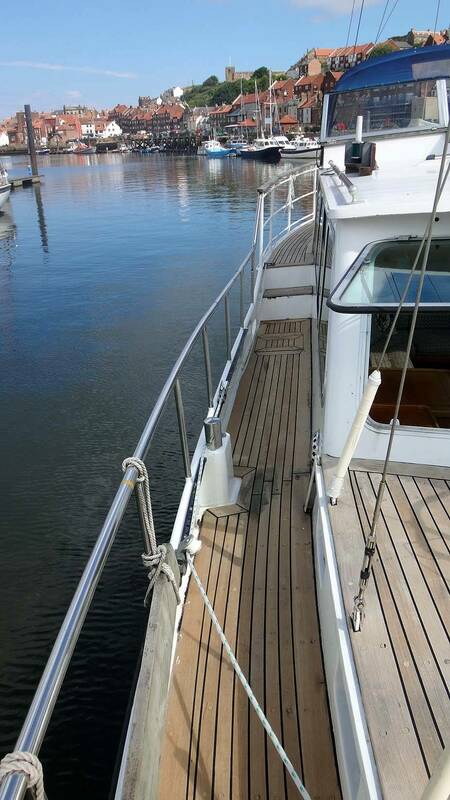 Large diameter stainless steel bow, side and stern rails for protection. 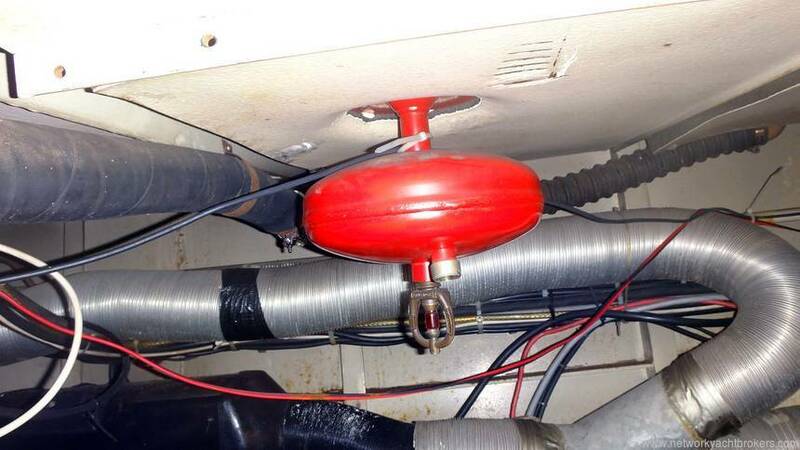 Hull protected by steel rubbing strake with rubber extrusion. Bow fitting with stainless steel stem head with nylon roller. 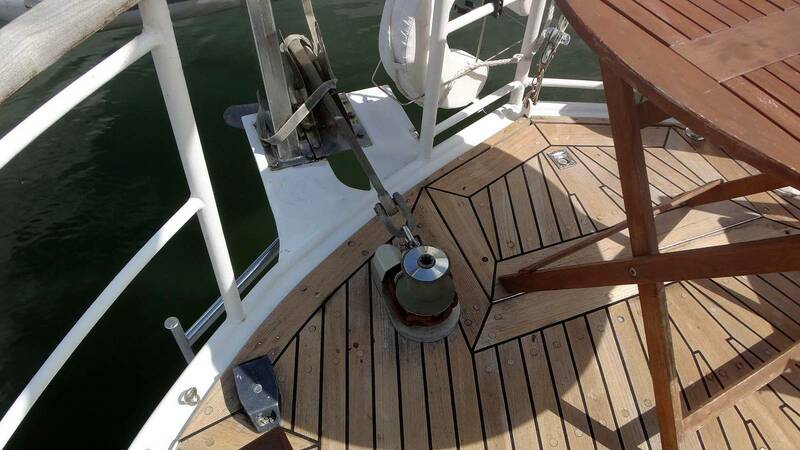 Deck mounted electric windlass. 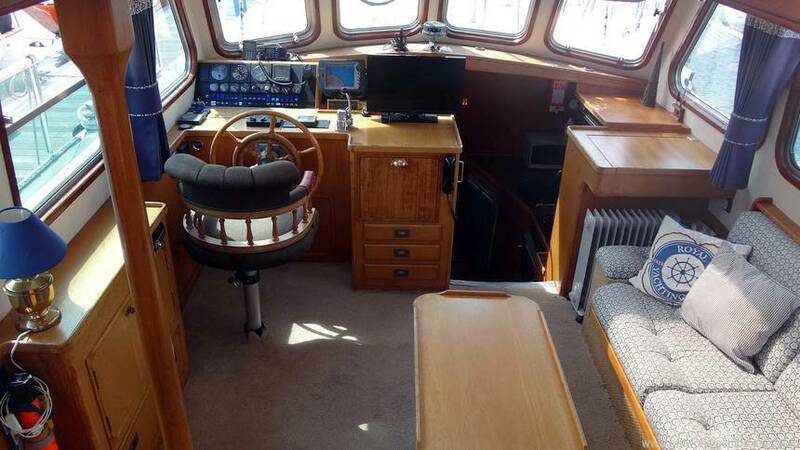 Wheelhouse with large panoramic windows giving excellent visibility. 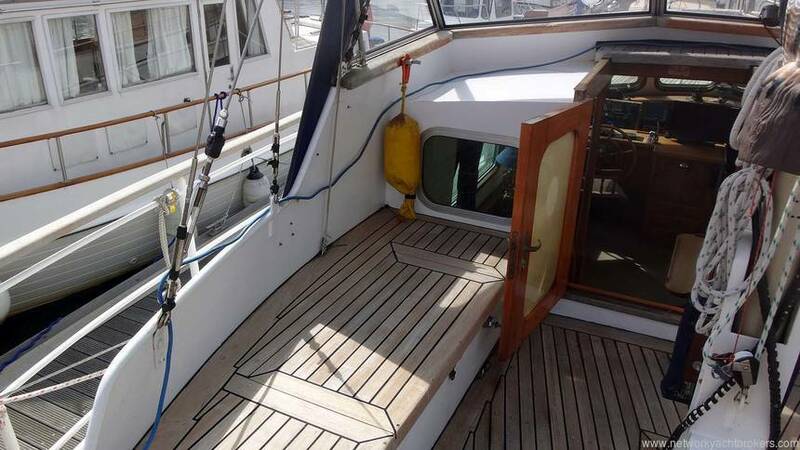 Raised aft deck with painted stanchions topped with teak capping rails. 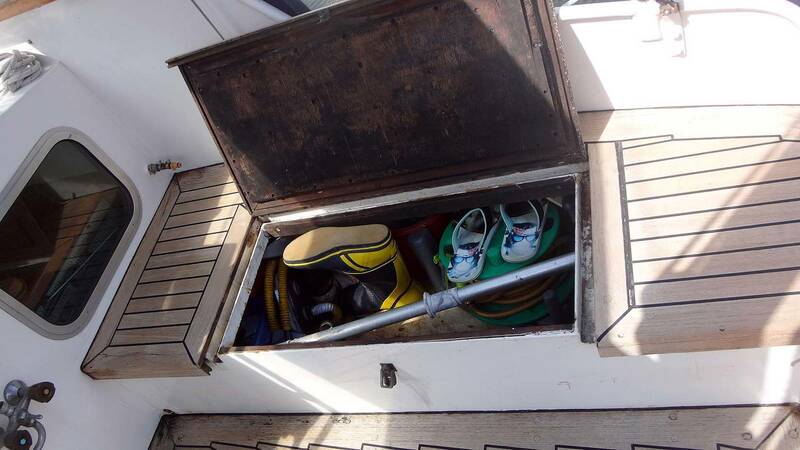 Access to emergency steering and aft mooring windlass. 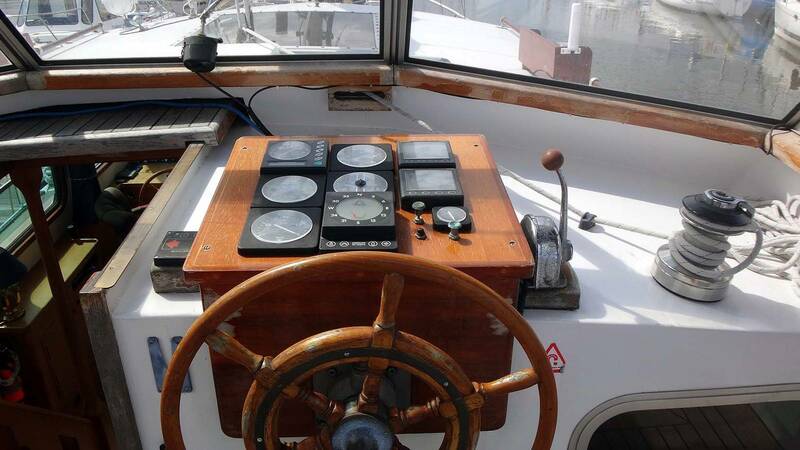 Helm position with wooden spoke wheel and engine instrumentation. 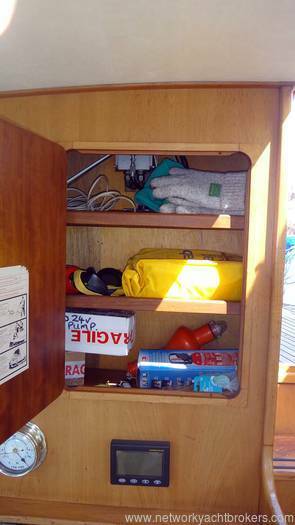 Locker storage either side of the wheelhouse. 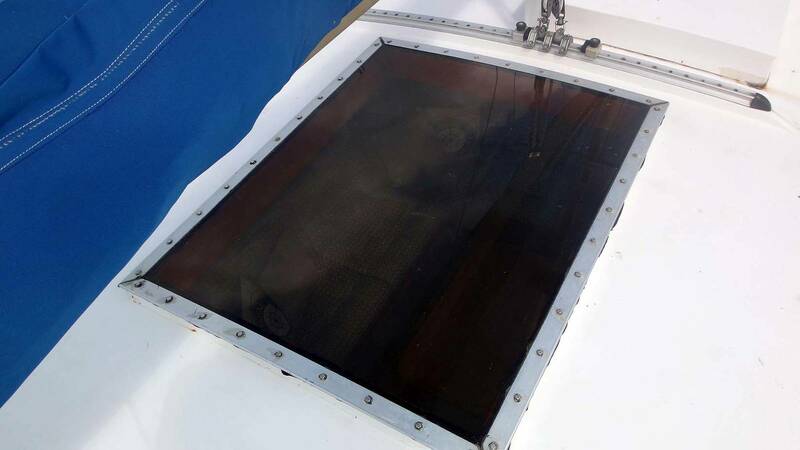 Glass windshield which is removable for canal work. 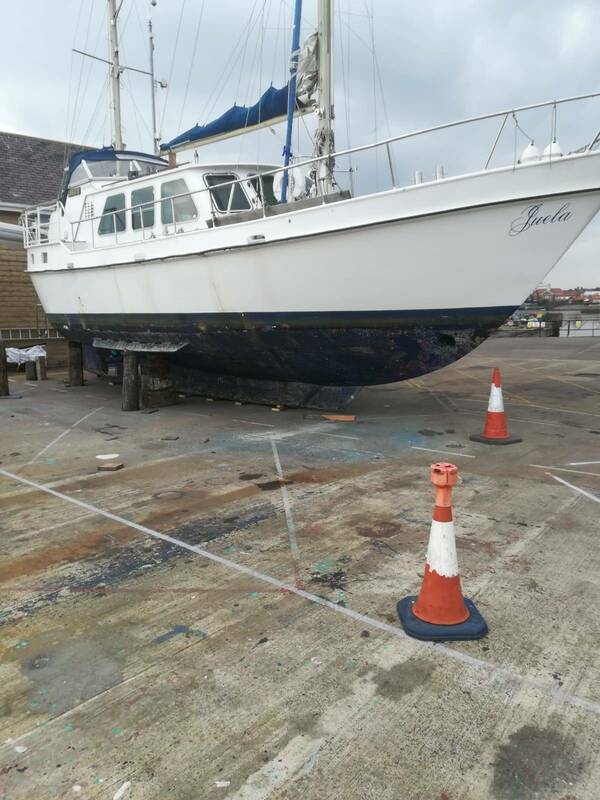 Heavy duty bollard style mooring points. Main mast shrouds are inboard allowing easy and unhindered access forward. 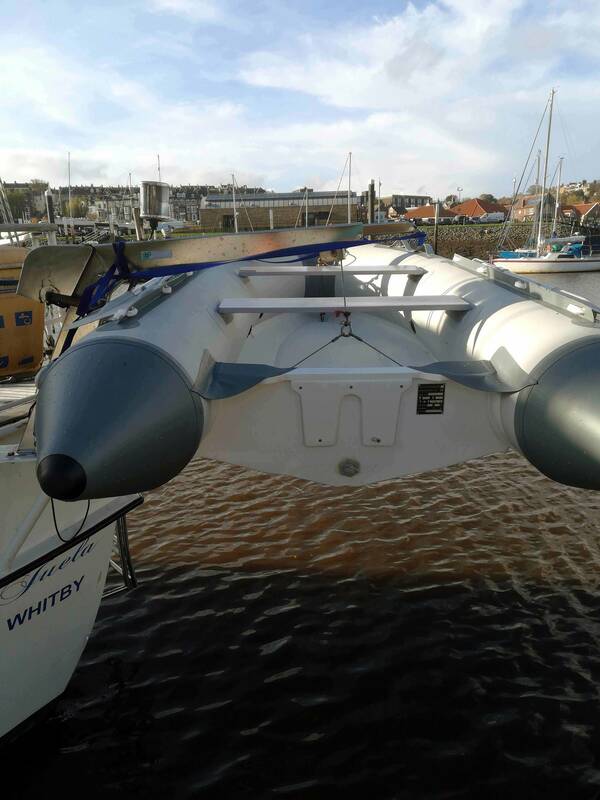 Stainless steel aft davits allow tender to be stored inflated and easy to launch. 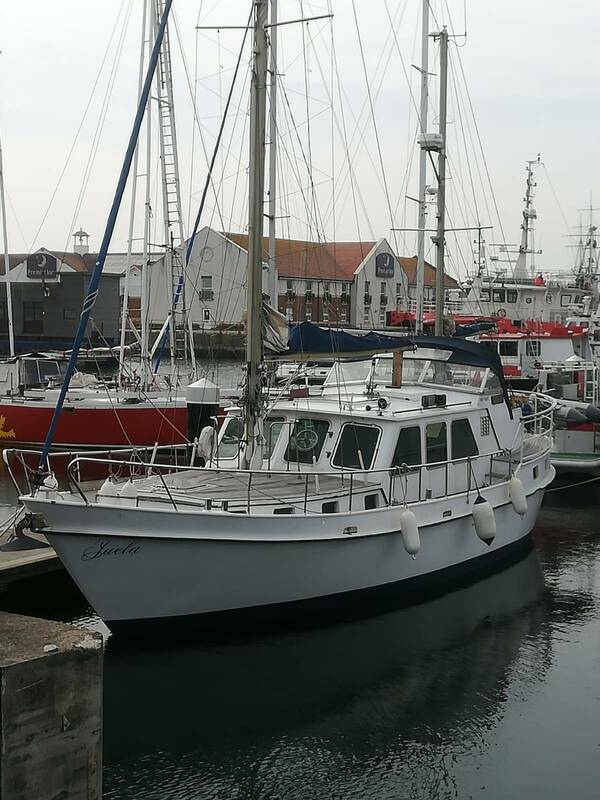 Vessel powered by a well maintained and economical workhorse of a diesel engine. The unit in question is a Volvo Penta MD70C which is a low revving engine designed to run for long periods of time. 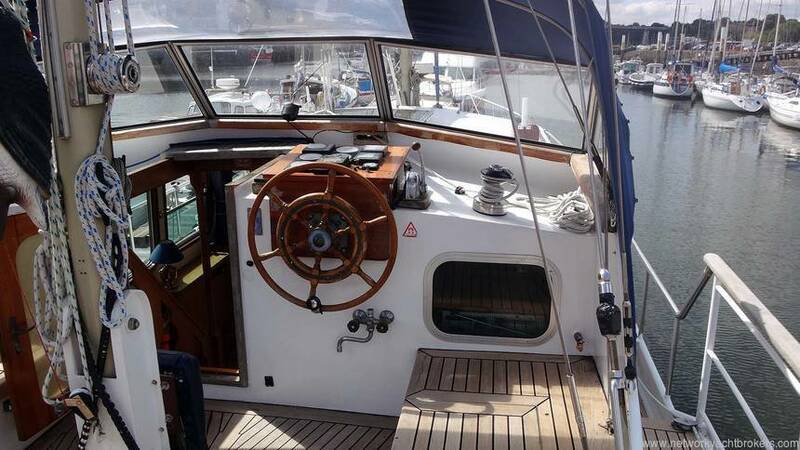 This is a 6-cylinder, 135hp with a reduction gearbox driving a stainless steel shaft and 3-bladed bronze propeller. The vessel has its own engine room which is accessed via a watertight door from the aft cabin. 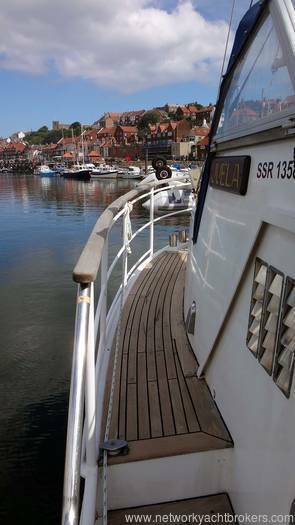 Although there is no standing headroom , access is excellent and all sides of the engine are accessible for servicing and daily checks. 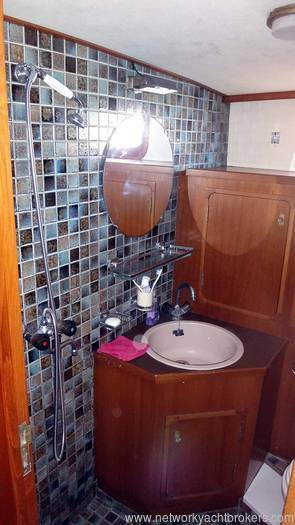 The saloon floor is removable in the event that greater access to this area is required. 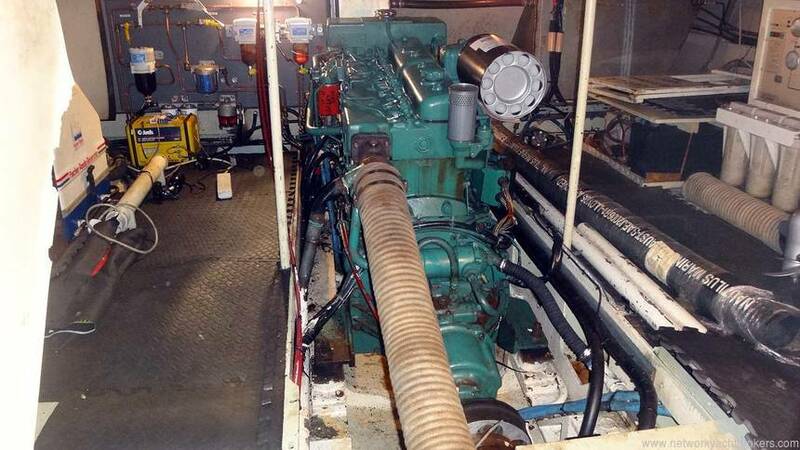 This is a Fischer Panda 4.7Kva generator which will provide essential power when at anchor or on remote unserviced berths. This has completed 478 hours and is in a fully operational condition. 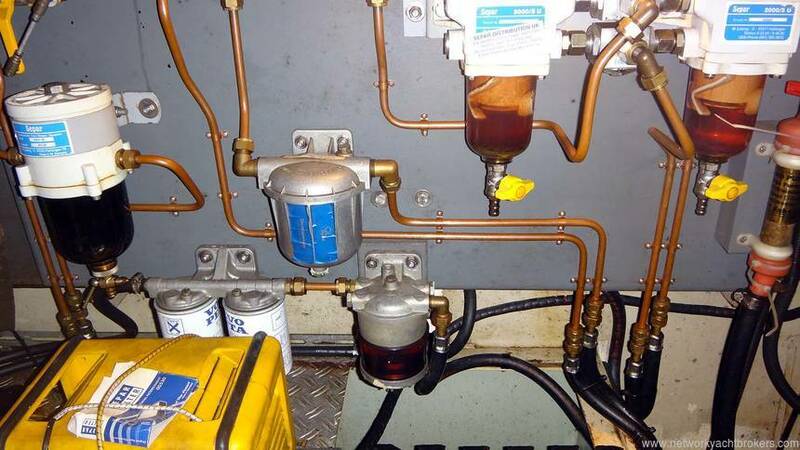 The fuel system is very efficient with all pipework from tanks fitted with isolators and pre-filters. 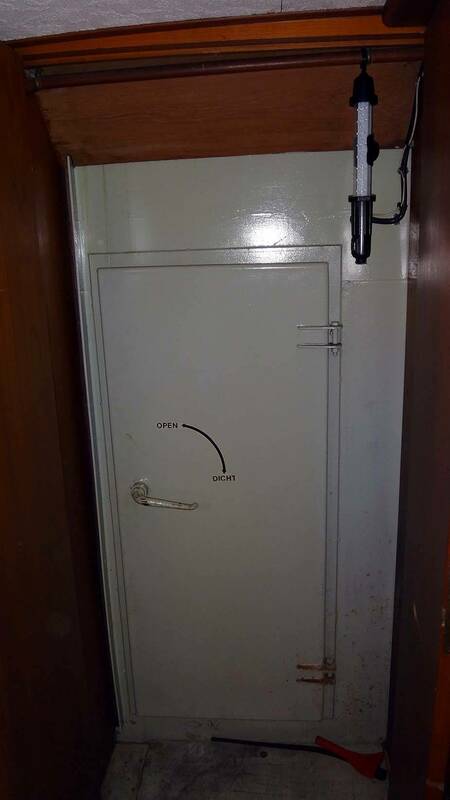 The main bunker contains 1400 litres, and the engine can run from this or a dedicated 91-litre day tank. The purpose of the day tank is to monitor fuel usage on long passages. It is also handy if contamination occurs as it has its own filler and can be isolated away from the main tank preventing cross contamination. 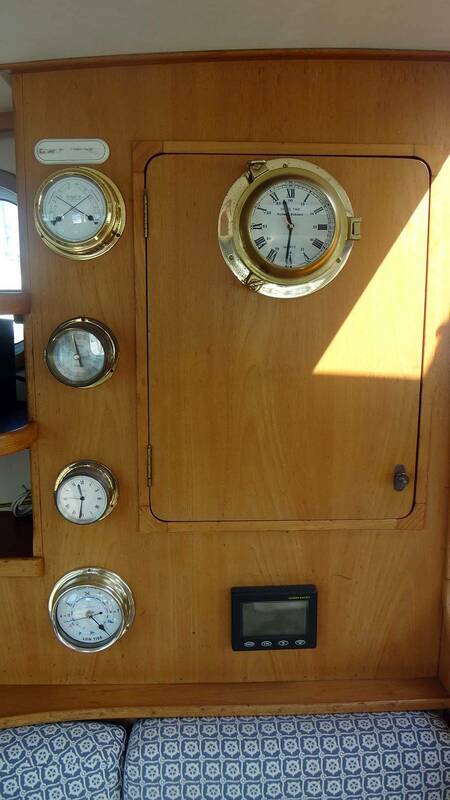 To starboard of the engine room is a water maker. This is not in commission under the present or previous owner as they are marina based and have only completed short coastal journeys. This can quickly be put back into operation if required by future owners spending extended periods at sea. The boat can be driven from the upper and lower helms. 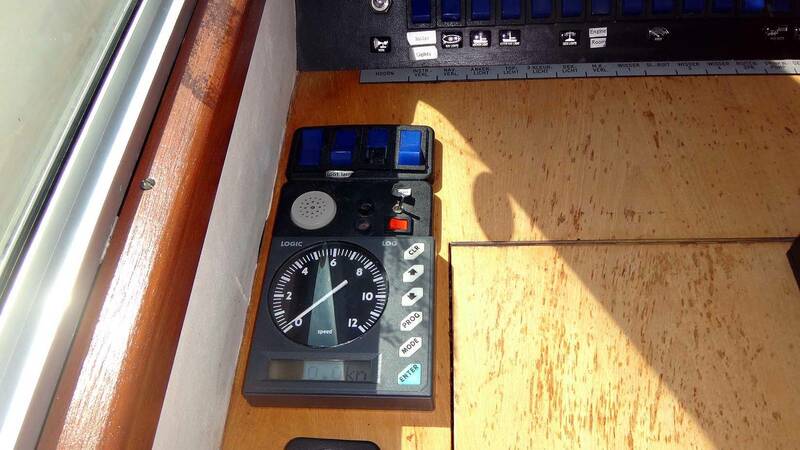 Both are fitted with single lever engine controls and engine instrumentation. 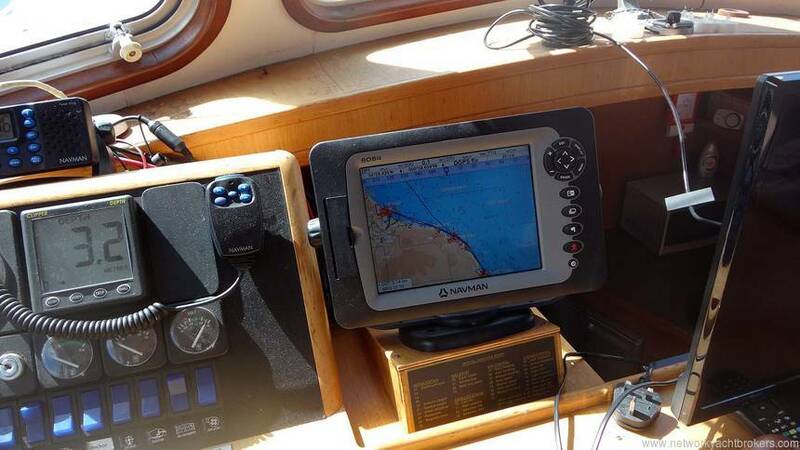 The lower helm has far more comprehensive switch panel and navigation aids. 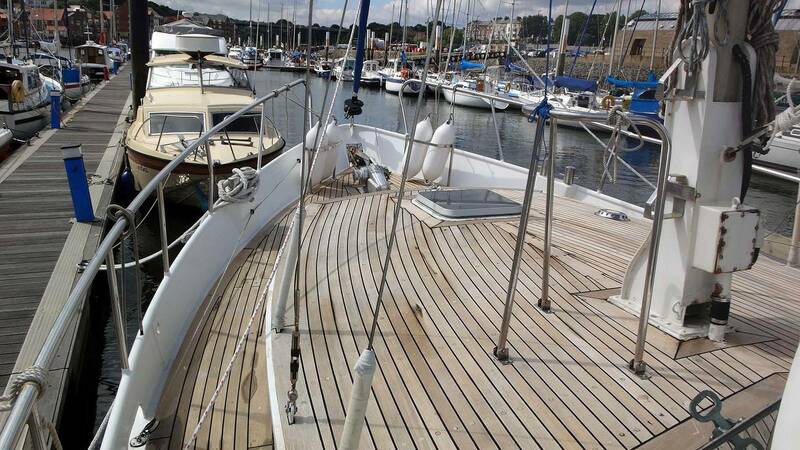 Ketch rigged yacht with deck stepped aluminium, main and mizzen masts. 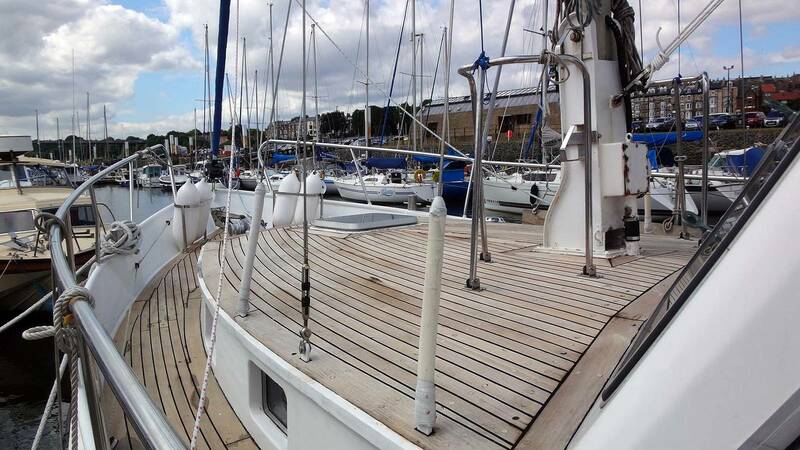 Both masts are fitted with climbing steps allowing maintenace to be carried out easiliy. All standing rigging is stainless steel and all running rigging is terylene in good working condition. 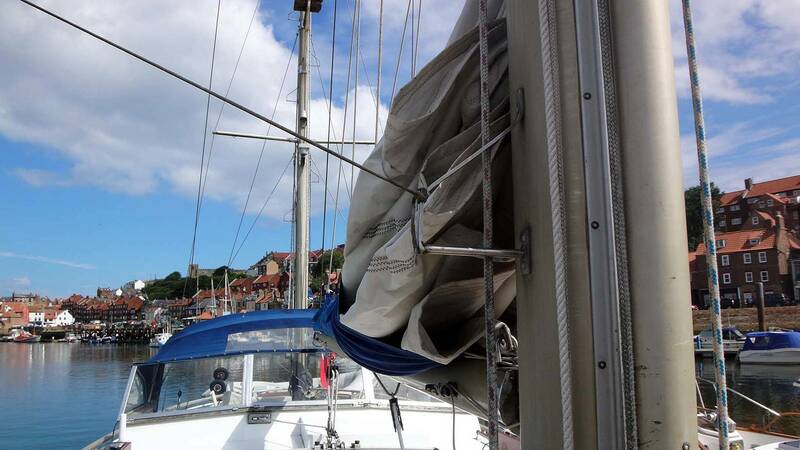 Reefing on the main and mizzen is slab reefing and the genoa is roller reefing. There is a baby stay attachment on the main mast and deck if required. 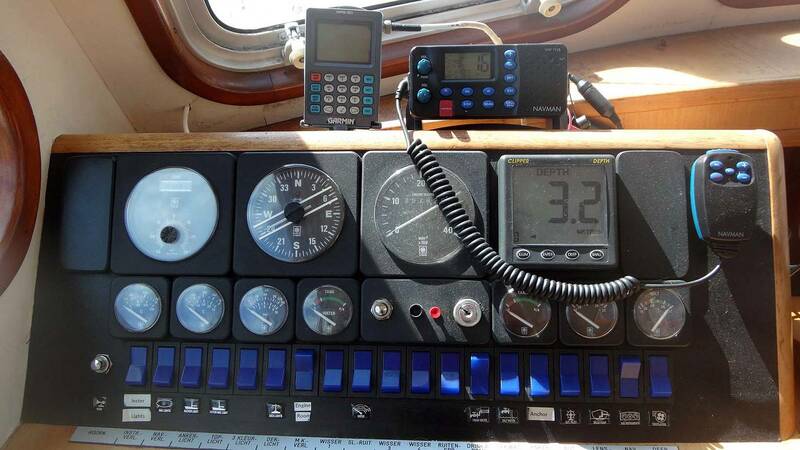 The yacht is rigged for cruising chute with dedicated halyard and pole. 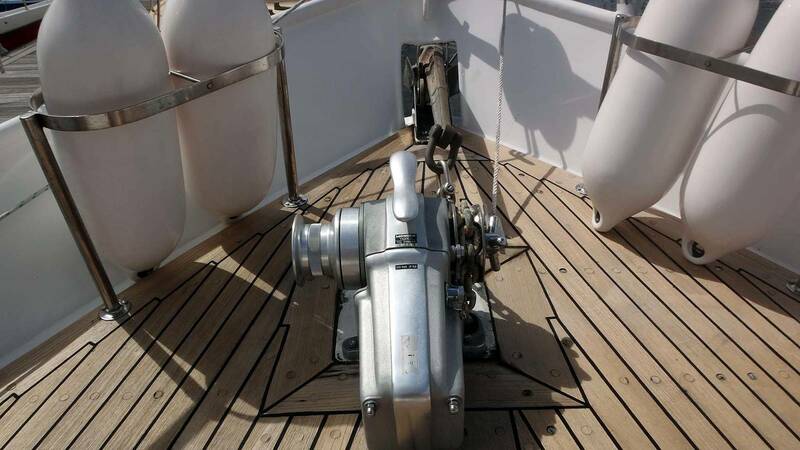 Winches are by Ences and include ST26 genoa sheet winches, ST18 on main mast, ST22 main sheet 1 18 on mizzen. 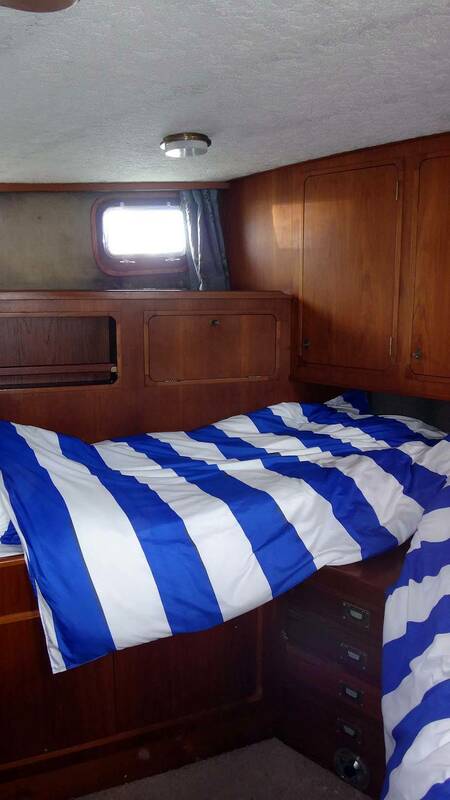 Sails include a main, a mizzen, a genoa with UV strip and a cruising chute. 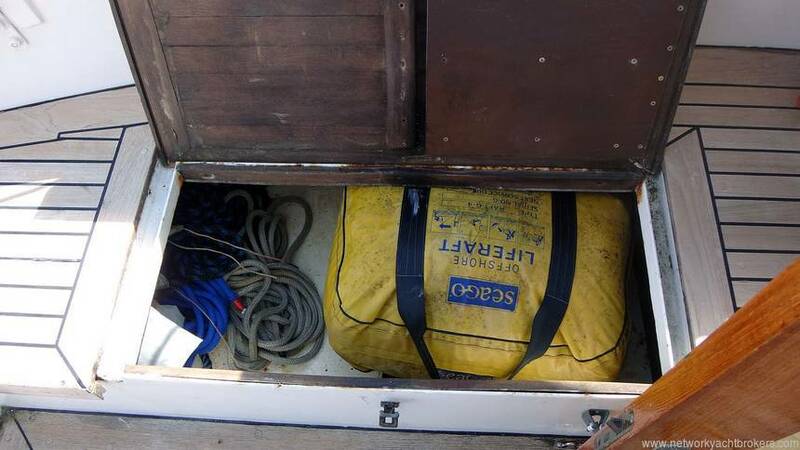 Mainsail and mizzen monted in lazybags on their respective booms. Both masts are fitted in tabernacles allowing spars to lie flat when on canal transit journeys. 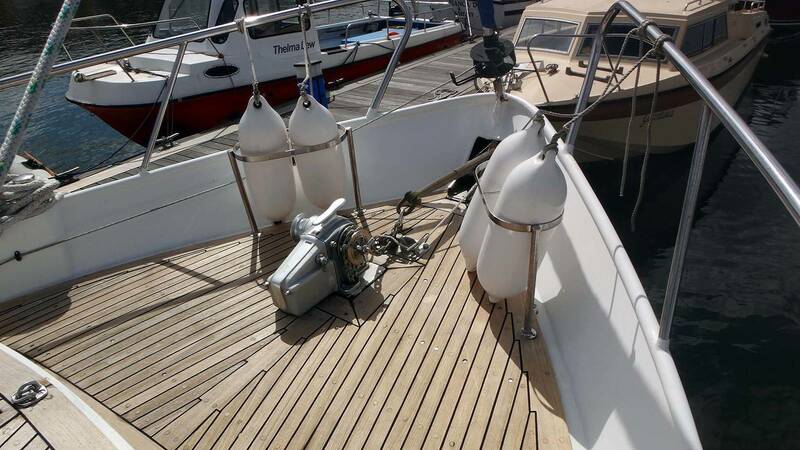 Lofrans deck mounted anchor windlass with rope and chain gipsies. CQR main anchor with chain.